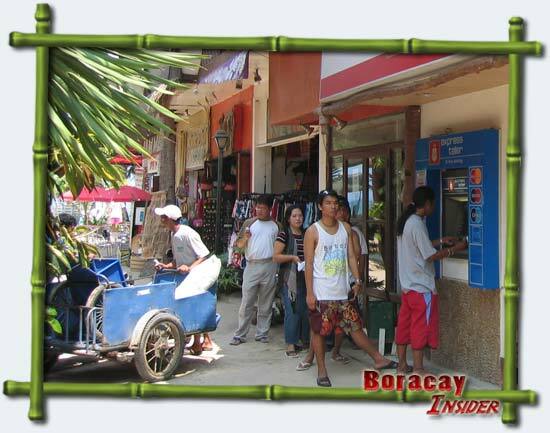 ATMs in Boracay have grown in number as more and more people visit the place. If you find yourself needing some cash on the island, you can just use the ATMs there. There are currently fourteen automated tellers to choose from. This has five ATMs on the island. One is located at the main road close to the D'Mall rear entrance. There is another one at White Beach. The others are at Plazoleta and the Crafts of Boracay Department Store. The Allied Bank at D’Mall entrance will accept the Visa Credit Card (cash advance), Expressnet, Megalink and BancNet. The ATM will also accept Plus and China Union Pay (Hong Kong and China ATM debit cards). There is a Metrobank ATM at the main road along Jopines store. There is also one at White Beach and another in D’Mall. Barangay Yapak and Boracay Shangri-la Hotel also have Metrobank ATMs. To reach ATMs in Boracay White Beach, you should board a tricycle. BPI has an ATM alongside Boracay Beach Chalet by the beach front at station 2. The other ATM is inside D’Mall. The other ATMs are connected to the BPI branch. You can use the BPI ATMs for Maestro, Cirrus, Mastercard, Plus, Visa credit card (cash advance), Expressnet, Megalink and Bancnet. These automated tellers can be used with Mastercard and Visa credit cards for withdrawing money. You may use this if there are no funds for your debit / credit card. This process is known as cash advance transaction. It is a good idea to keep some extra cash handy. During peak tourist season (i.e., March to May), the ATMs may go offline or become short of cash. Actually this happens rarely, but it is better to be sure. If you do not want to bring cash, you can use the cash advance transaction described above. Also remember that the lines to these tellers can get long. Also keep in mind that not all cards are accepted. Check first if your card is accepted. Apart from cash, consider bringing some traveler’s checks. If you are carrying cash, bring small bills. Using the ATMs in Boracay is easy. But if you are carrying foreign currency, you can exchange them at various spots in the island. The exchange rates offered varies; check as many as possible. The more attractive rates are those farther from the beach.